Initially, Thistle’s Innovation Hub is able to assist businesses through face-to-face consultations and discussions designed to understand the business’ key goals and targets. We then work with you to develop your business, whilst applying our regulatory knowledge and exposure, to establish a compliant business which also meets your commercial goals. As part of this, we can help you establish effective governance controls, as well as ensure your internal systems are compliant and meet the requirements proportionate to your business. The Thistle Innovation Hub team can work with you to build a sustainable and robust business plan that will be the fundamental base for the ongoing development of your business. Alongside the business plan, a detailed suite of compliance policies and procedures will be created to build out the business and facilitate compliance to the necessary regulations. This can include policies such as Anti-Money Laundering, Training and Competency, IT Security, Complaints and Data Protection. Thistle Initiatives have a number of lawyers which we regularly engage with who are able to assist with the drafting of terms and conditions, privacy policies, ad hoc requests and legal opinions, where required. This will ensure that you have legally ratified documents in place before you launch your product. As part of establishing a new company, Thistle understands that there are a number of costs associated which means initial capital is important. To this effect, the Innovation Hub has partnered with venture capitalists and private equity funding sources to help support businesses in obtaining capital. Although dependent on meeting the funder’s requirements, we are able to broker these relationships in a bid to further support firms in becoming fully operational. Some of the funding partners we have partnered with include: – Craven Street Capital – Medici Advisors Thistle also understands that developing a new business with a number of components (particularly those with elements of technology) are complex and require appropriate experience and resource. Certainly, during the initial stages, many firms opt to use third parties as a means of supporting the business with its operations as well as meet its regulatory requirements. As part of this, the Innovation Hub has teamed up with a number of third parties who are able to support businesses at the initial stage. One such partner is e-money institution, MangoPay. MangoPay provides an electronic money solution for firms looking to transfer payments between two parties, which offers an alternative to firms holding client money which can be difficult to obtain and monitor. 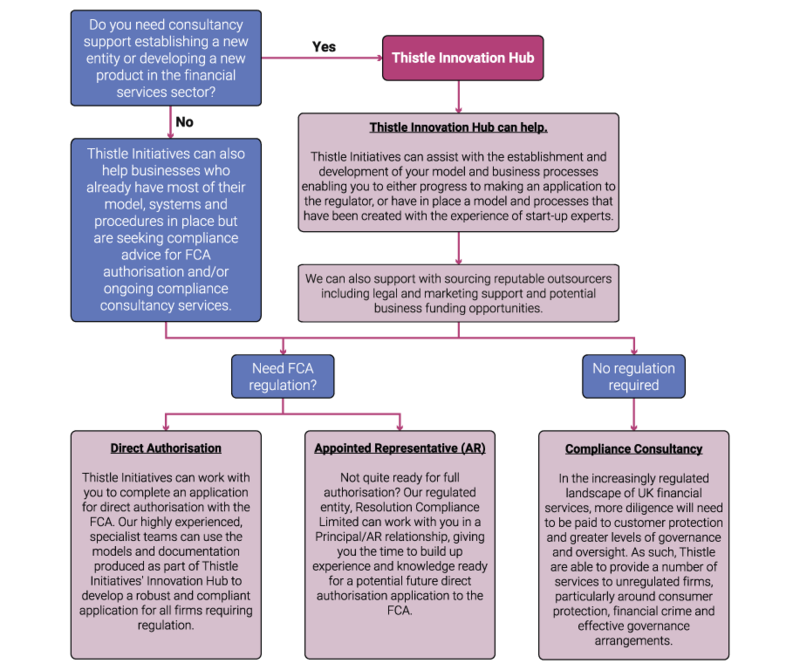 A direct authorisation application to the FCA – Thistle Initiatives’ consultancy arm can assist you in completing a direct authorisation application to the FCA. Whether it be a payment services, e-money or FSMA application, our highly experienced, specialist teams can use the models and documentation produced during your company’s time with the Innovation Hub to develop a robust and complaint application for all firms requiring regulation. Developing your company through Thistle Innovation Hub and then your FCA application with Thistle Initiatives allows for an end-to-end, personalised process meaning that from the initial drafting of the business plan through to the FCA approval process your business can be developed with consistent and reliable compliance advice. Thistle Initiatives can also continue to support your company through the first steps post FCA authorisation as compliance consultants. Become an Appointed Representative (AR) – Our regulated sister company, Resolution Compliance Limited (FCA number: 574048), has multiple benefits should your firm’s business fall within the scope of an AR. Once onboarded by Resolution Compliance and then approved by the FCA, you will have access to compliance support from an experienced Compliance and Supervision Manager who will be allocated to your business. This will allow your business to grow steadily whilst obtaining the relevant experience and knowledge required should you wish to apply to become directly authorised. Becoming an AR often allows your business to start trading and operating quicker whilst an application to obtain Direct Authorisation is made to the FCA simultaneously, should you wish to do so. Help develop and establish robust processes as an unregulated entity. At the end of the Thistle Innovation Hub process it might be that your business does not require regulation and, as such, no application need be made to the FCA. 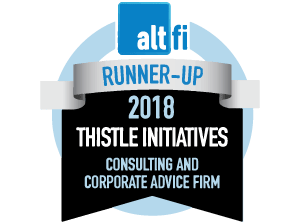 However, given the increasing interest in Fintech and new technologies by the FCA, Thistle Initiatives can provide support and guidance for any firms on the edge of the FCA’s radar. For instance, we can assist cryptocurrency firms requiring guidance on anti-money laundering procedures or appropriate due diligence.